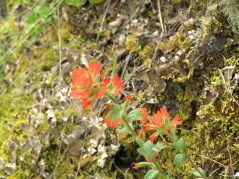 We often take the Olympic Discovery Trail west from the Morse Creek parking lot. 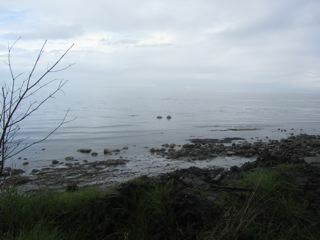 It's about a mile from the parking lot down to the water. Perhaps another half mile west there are a few rocks out in the Strait favored by the local river otters. There was one out there today, enjoying his catch of the day. While we were watching we noticed an eagle flying low. It dived towards the otter who slid off the rock into the water. The eagle resumed his course west. 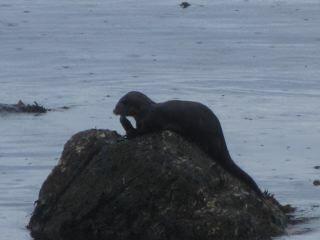 As soon as the coast was clear, the otter returned to the rock with his fish in his mouth. 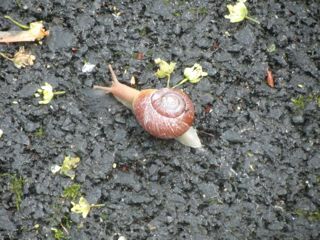 Also of note were the snails. 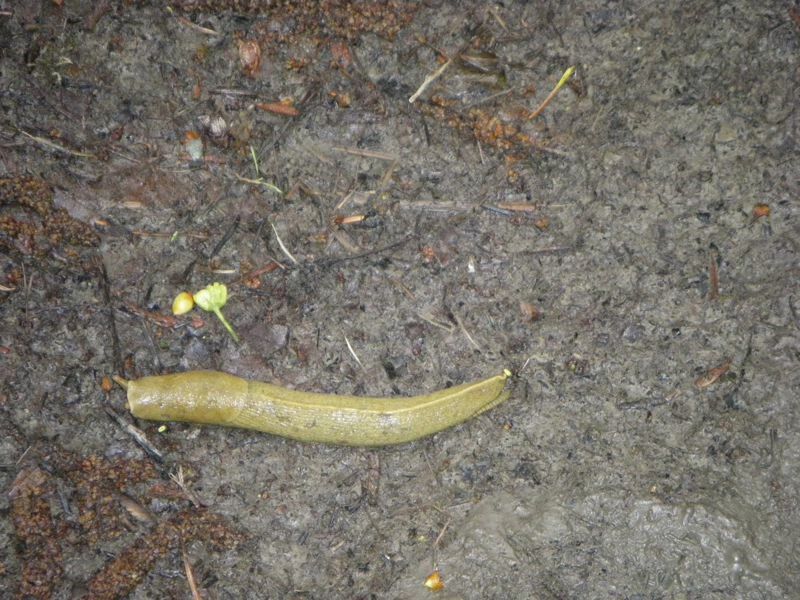 We often see slugs along this trail. 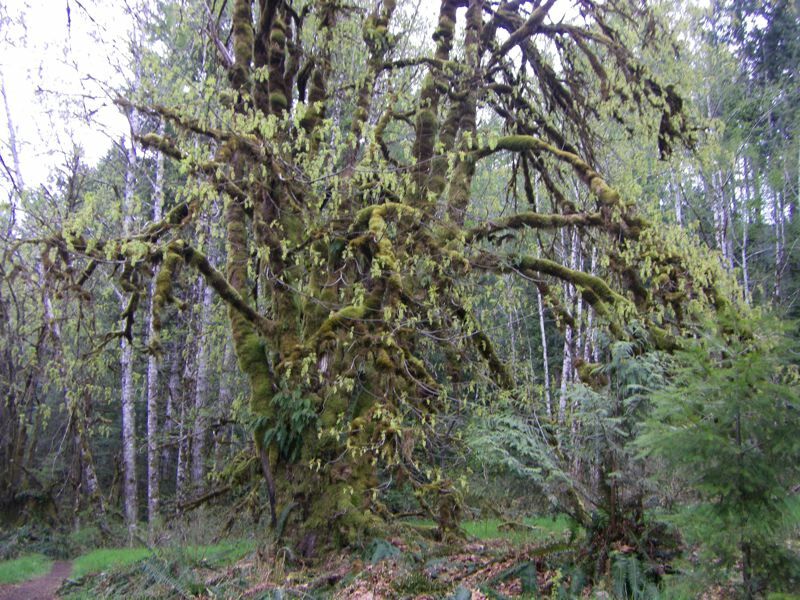 This is the Pacific Northwest, one of the great slug habitats of the continent, but we see snails much less rarely. Watch your step on the Spruce Railroad Trail. 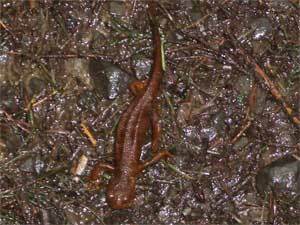 We've been spotting our share of salamanders, snakes and slugs. That's the three S's. Then again, it's always worth keeping one's eyes open on the trail. A lot of trails are closed right now. 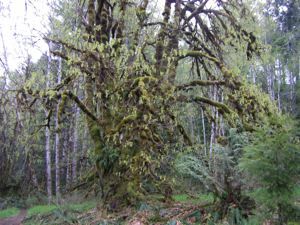 Whiskey Bend Road is more or less wiped out, and the Hoh Rain Forest is inaccessible. 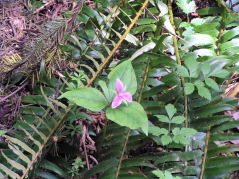 This means we are spending a lot of time on the Spruce Railroad Trail at Lake Crescent. We were out there a few days ago, and it sure smelled of spring. Today, it smelled even more spring-like. 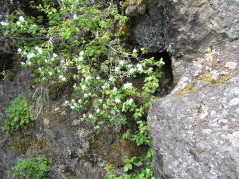 The currant and salmonberry blossoms are getting ready to bloom. Then we saw it. 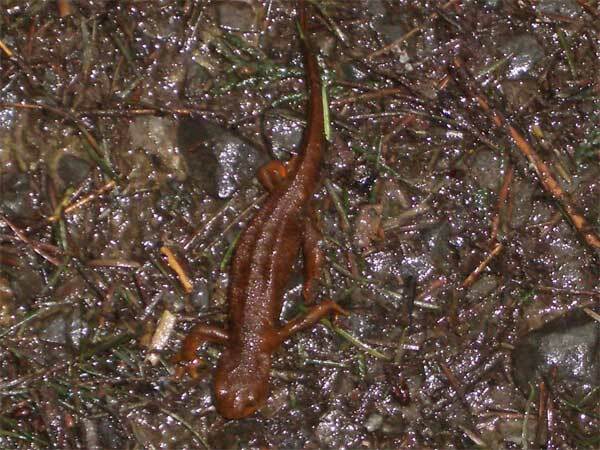 The first salamander of spring! 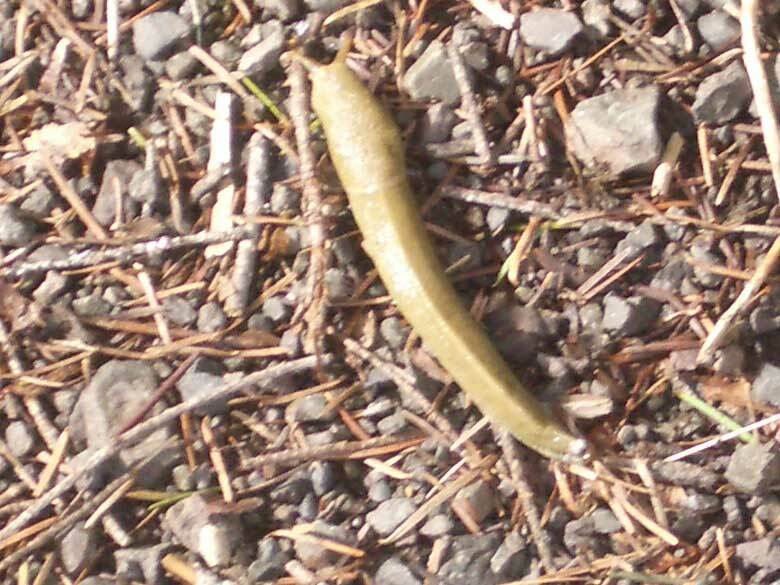 We knew that slugs could not be far behind. We were right. 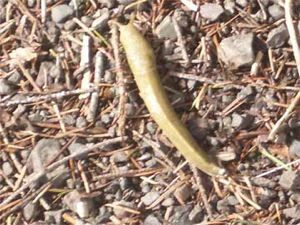 A bit down the trail, there it was, a slug, slugging its way through the trail debris. 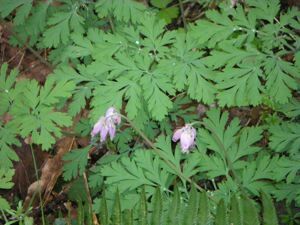 Eventually other trails will reopen, and even the high country will thaw out and open up, but for now, we are going to watch for spring. 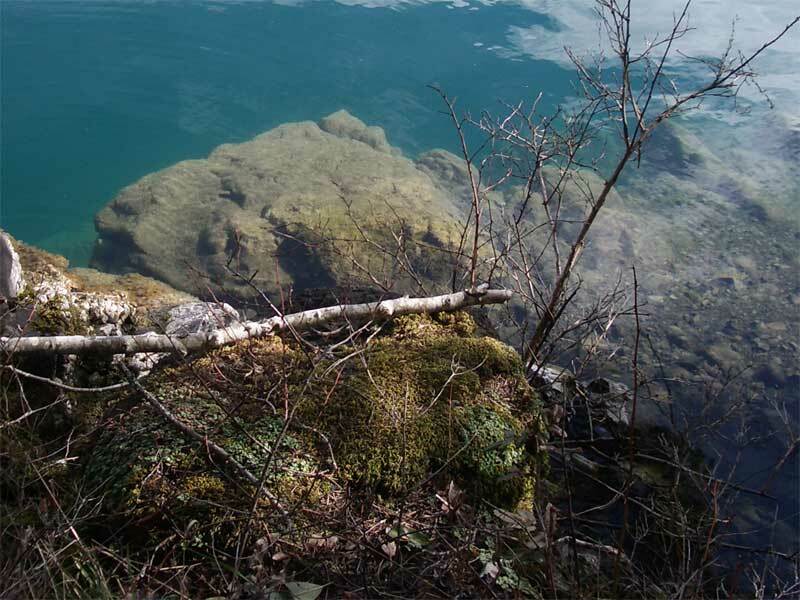 We often have trouble believing how clear Lake Crescent water is. 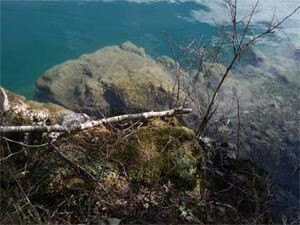 The upper rocks in this picture are under water. The water is radioactive pool blue, even without radioactive waste to make it glow. 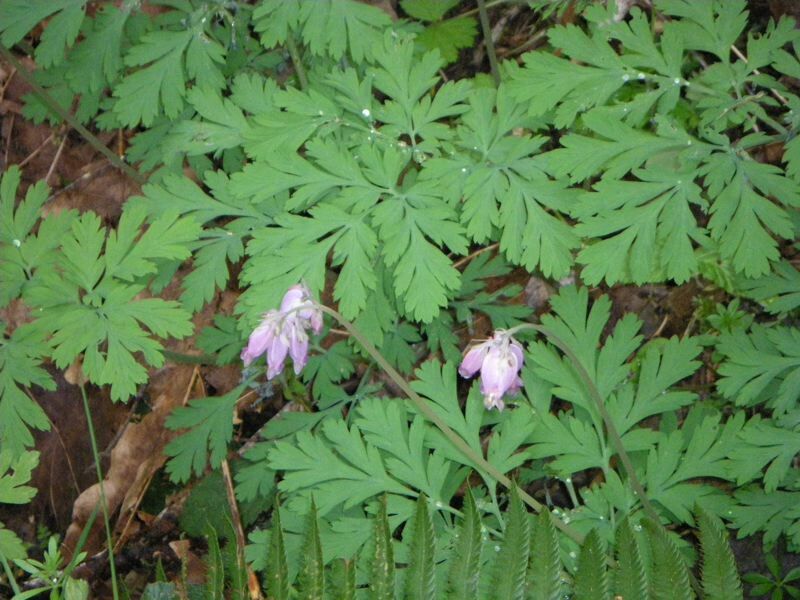 We consider this one of the great signs of spring. 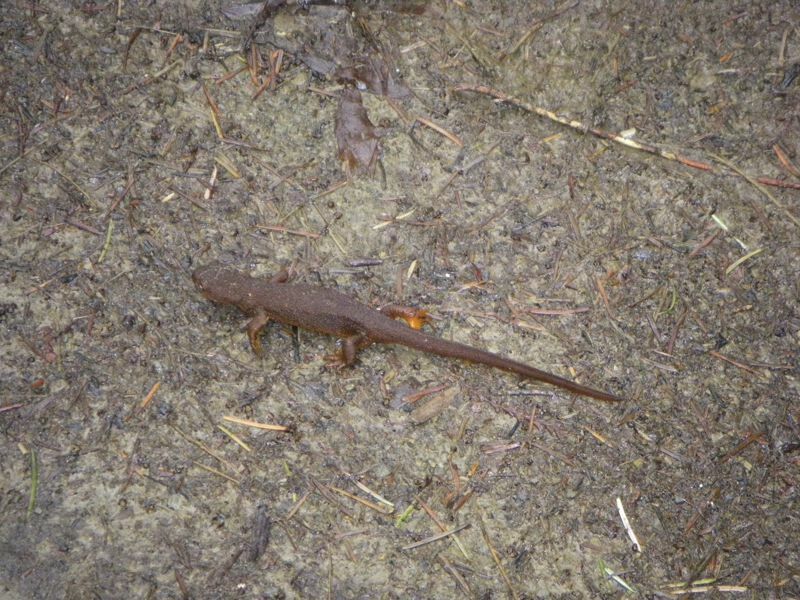 The salamanders are back on the Spruce Railroad Trail. 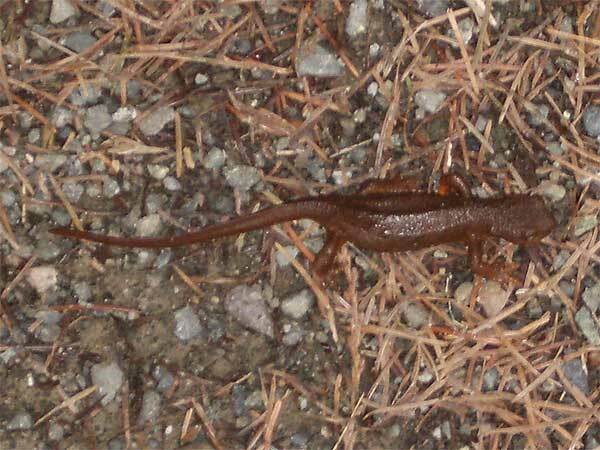 There were also a few slugs, and the wild currant is in bloom, but the salamanders are the true sign of the season. 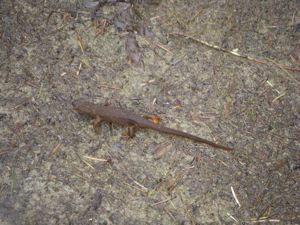 Today there was a veritable infestation of them, perhaps because it started to rain on our return hike. We saw at least a dozen, though we may have seen one or two of them twice. 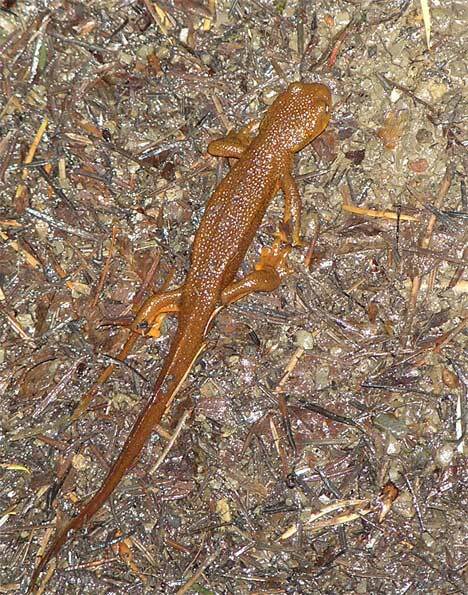 We think they are Olympic torrent salamanders, which are only found on the Olympic Peninsula. 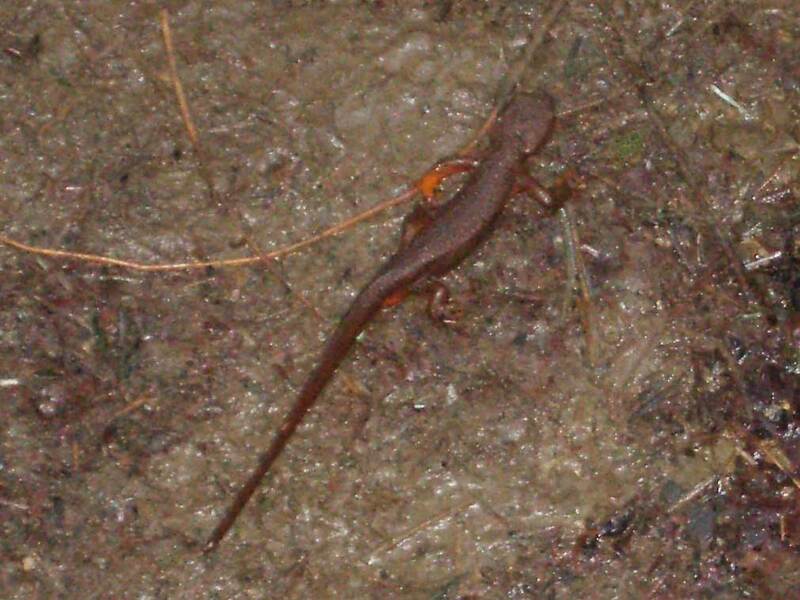 For more info, check out this site or this one for the official park notes on these creatures. This would be a great time to take a hike along Lake Crescent, but please, watch your step, and you may see some of these little creatures. 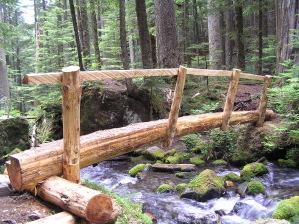 We were up the Lake Angeles Trail today and noticed that the Park Service has put in a new bridge over the river. It is bigger and higher than the old bridge, but it feels quite sturdy and is just as easy to cross. Our thanks to the National Park Service. The trail itself is in excellent shape, but do watch out for the slugs. 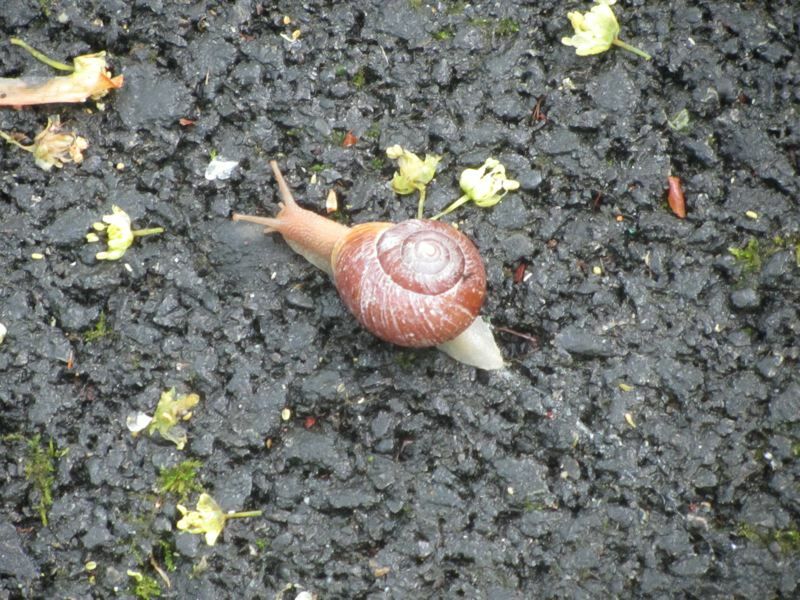 They area all over the place, and no one wants to step on these kindly, if rather sluggish, denizens of the forest. 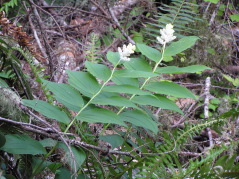 Check out the specimen to the right. 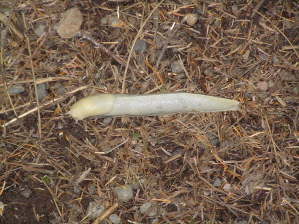 It's some kind of albino slug, and it even wiggled its antennae at us. 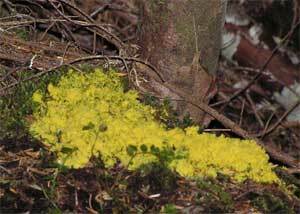 In addition to slugs, the recent wetter weather has also brought out the fungi, including this lovely yellow marvel. It fairly glowed at us this gray day. It's a good foot and a half across and probably growing at a good clip. We were out on the Spruce Railroad Trail today, and we couldn't help noticing that the mud is back. 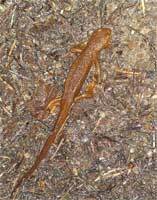 That and the salamanders. 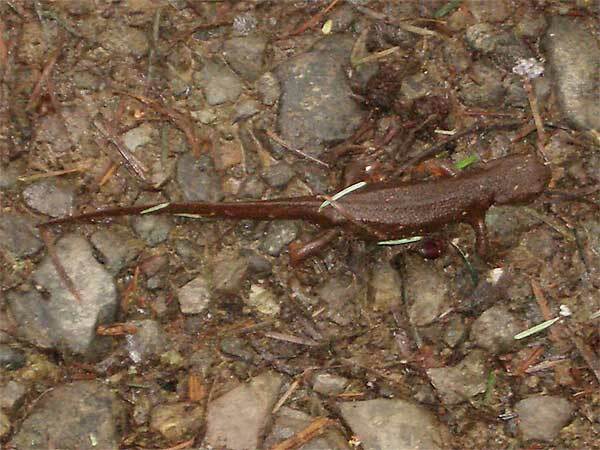 You have to keep your eyes open, or you'll step on one of the unique species of the Olympic Peninsula. 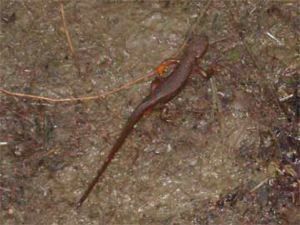 These little lizards are a sort of red gold, and as you can see in the photograph, they rather blend in to the background. The rain brings them out and it brings out the slugs, so this is a great time to explore the trails of Olympic National Park. On our way west to the trailhead, we heard a cautionary tale about feeding wild animals. We picked up some gravel at the quarry a bit off of 101, west of the Elwha. We're retail customers and drive a Honda Civic. Most of the folks here drive umpty ton gravel trucks, or diggers, or grinders. It's sort of a grown up Tonka paradise. Anyway, we stopped in at the office to be sociable, and pay for our gravel, and we heard the story of cougar. It had been a hard winter, and the cougar was about as thin as a housecat. The owner of the quarry had never seen a big cat so skinny, and having several hundred pounds of hamburger going stale in the freezer decided to feed the poor thing. Needless to say, he carried his pistol, and he kept his distance, but the cat went for the beef and not for him. As the season progressed, the cougar put on some weight and and started to flesh out a bit. A few hundred pounds of hamburger will do that to beast, or man. There's a documentary on this that just came out, which says something about restating the obvious. Needless to say, having been fed, the cougar was much more energetic, and the owner of the quarry was figuring it was time for the creature to return to the wild. Then, one day, the cougar dropped by a neighbor's place and went for the ducks and geese right on the front porch. The neighbor shot it. 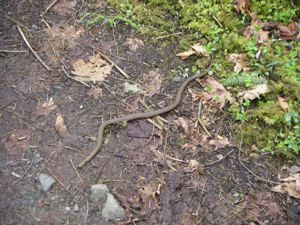 So, if you do come to the Olympic Peninsula, think twice before feeding the wild animals.